I don’t think we’re clear on what simulation is NOT. RANDOMNESS IS NOT NECESSARY, for the simple reason randomness is merely a state of knowledge. Hence this classic post from 12 June 2017. That form of reasoning is used by defenders of simulations, a.k.a. Monte Carlo or MCMC methods (the other MC is for Markov Chain), in which gremlins are replaced by “randomness” and “draws from distributions.” Like the car run by gremlins, MCMC methods get you where you want to go, so why bother looking under the hood for more complicated explanations? Besides, doesn’t everybody agree simulations work by gremlins—I mean, “randomness” and “draws”? Here is an abbreviated example from Uncertainty which proves it’s a mechanical process and not gremlins or randomness that accounts for the succeess of MCMC methods. First let’s use gremlin language to describe a simple MCMC example. Z, I say, is “distributed” as a standard normal, and I want to know the probability Z is less than -1. Now the normal distribution is not an analytic equation, meaning I cannot just plug in numbers and calculate an answer. There are, however, many excellent approximations to do the job near enough, meaning I can with ease calculate this probability to reasonable accuracy. The R software does so by typing pnorm(-1), and which gives -0.1586553. This gives us something to compare our simulations to. I get 0.158, which is for applications not requiring accuracy beyond the third digit peachy keen. Play around with the size of n: e.g., with n = 10, I get for one simulation 0.2, which is not so hot. In gremlin language, the larger the number of draws the closer will the approximation "converge" to the right answer. All MCMC methods are the same as this one in spirit. Some can grow to enormous complexity, of course, but the base idea, the philosophy, is all right here. The approximation is seen as legitimate not just because we can match it against an near-analytic answer, because we can't do that for any situation of real interest (if we could, we wouldn't need simulations!). It is seen as legitimate because of the way the answer was produced. Random draws imbued the structure of the MCMC "process" with a kind of mystical life. If the draws weren't random---and never mind defining what random really means---the approximation would be off, somehow, like in a pagan ceremony where somebody forgot to light the black randomness candle. Of course, nobody speaks in this way. Few speak of the process at all, except to say it was gremlins; or rather, "randomness" and "draws". It's stranger still because the "randomness" is all computer-generated, and it is known computer-generated numbers aren't "truly" random. But, somehow, the whole thing still works, like the randomness candle has been swapped for a (safer!) electric version, and whatever entities were watching over the ceremony were satisfied the form has been met. Now let's do the whole thing over in mechanical language and see what the differences are. By assumption, we want to quantify our uncertainty in Z using a standard normal distribution. We seek Pr(Z < -1 | assumption). We do not say Z "is normally distributed", which is gremlin talk. We say our uncertainty in Z is represented using this equation by assumption. where Z is now said to be "standard normally distributed." We don't need to worry about the math, except to notice that it is written as a causal, or rather determinative, proposition: ``If U_1 is this and U_2 is that, Z is this with certainty." No uncertainty enters here; U_1 and U_2 determine Z. There is no life to this equation; it is (in effect) just an equation which translates a two-dimensional straight line on the interval 0 to 1 (in 2-D) to a line with a certain shape which runs from negative infinity to positive infinity. which gives 0.1608677, which is a tad high. Try lowering ep, which is to say, try increasing the step resolution and see what that does. It is important to recognize the mechanical method will always give the same answer (with same inputs) regardless of how many times we compute it. Whereas the MCMC method above gives different numbers. Why? Here is the gremlin R code, which first "draws" from "uniforms", and then applies the transformation. The ".s" are to indicate simulation. The first time I ran this, I got 0.1623, which is much worse than the mechanical, but the second I got 0.1589 which is good. Even in the gremlin approach, though, there is no "draw" from a normal. Our Z is still absolutely determined from the values of (u1.s, u2.s). That is, even in the gremlin approach, there is at least one mechanical process: calculating Z. So what can we say about (u1.s, u2.s)? 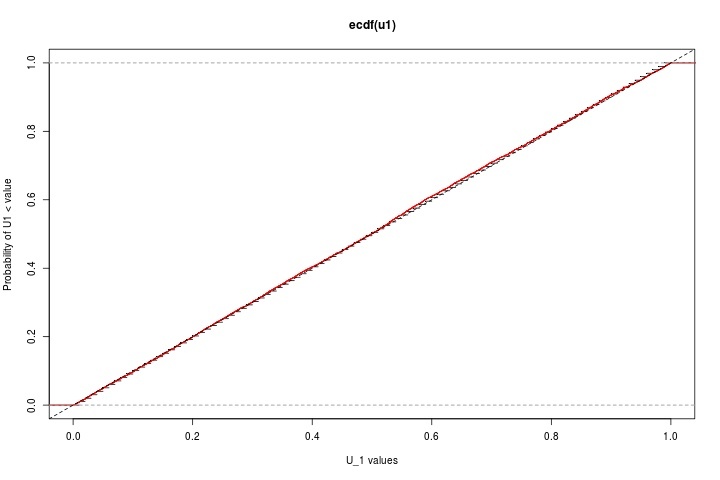 The values of U_1 are a rough step function; after all, there are only 99 values, while u1.s is of length n = 10000. This gives the first 20 values of the "random" u1.s sorted from low to high. The values of U_1 were 0.01, 0.02, ... automatically sorted from low to high. Do you see it yet? All u1.s is is a series of ordered numbers on the interval from 1-e6 to 1 - 1e-6. And the same for u2.s. (The 1e-6 is R's native display resolution for this problem; this can be adjusted.) And the same for U_1 and U_2, except the interval is a mite shorter! What we have are nothing but ordinary sequences of numbers from (roughly) 0 to 1! Do you have it? The answer is: The gremlin procedure is identical to the mechanical! The black dots are the (U_1, U_2) pairs and the red the (u1.s, u2.s) pairs fed into the Z calculation. The mechanical is a regular gird and the MCMC-mechanical is also a (rougher) grid. So it's no wonder they give the same (or similar) answers: they are doing the same things. The key is that the u1.s and u2.s themselves were produced by a purely mechanical process as well. R uses a formula no different in spirit for Z above, which if fed the same numbers always produces the same output (stick in known W which determines u1.s, etc.). The formula is called a "pseudorandom number generator", whereby "pseudorandom" they mean not random; purely mechanical. Everybody knows this, and everybody knows this, too: there is no point at which "randomness" or "draws" ever comes into the picture. There are no gremlins anywhere. Now I do not and in no way claim that this grunt-mechanical, rigorous-grid approach is the way to handle all problems or that it is the most efficient. And I do not say the MCMC car doesn't get us where we are going. I am saying, and it is true, there are no gremlins. Everything is a determinate, mechanical process. So what does that mean? I'm glad you asked. Let's let the late-great ET Jaynes give the answer. "It appears to be a quite general principle that, whenever there is a randomized way of doing something, then there is a nonrandomized way that delivers better performance but requires more thought." We can believe in gremlins if we like, but we can do better if we understand how the engine really works. There's lots more details, like the error of approximation and so forth, which I'll leave to Uncertainty (which does not have any code). Find the values of U_1 and U_2 that correspond to Z = -1. Using the modern language, what can you say about these values in relation to the (conditional!) probability Z < -1? Think about the probabilities of the Us. What other simple transforms can you find that correspond to other common distributions? Try out your own code for these transforms. What if your car IS a Gremlin? DAV :: You beat me too it! 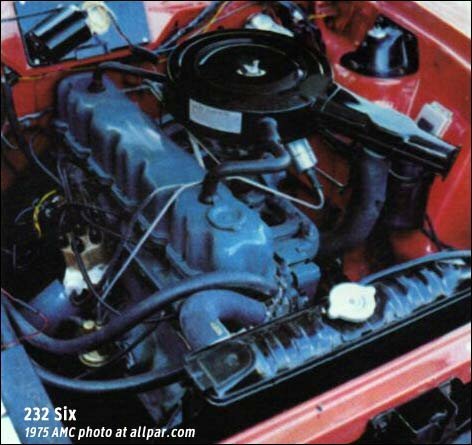 Later one drove an AMC Spirit? or Eagle? Anyway, we can use a similar setup using thrown dice. Everything about thrown dice is mechanical, though we may not know all of the conditions in the environment with sufficient resolution and accuracy to be able to determine the outcome with certainty. Still, it is certain that the outcome is strictly due to mechanics. Randomness simply means that we lack the knowledge needed to make statements that are fully certain, given all of the necessary and sufficient conditions that are operating in our system. Pi computed to 22.4 trillion digits, by Swiss colleague P. Trueb. Peter Trüb describes the pi project in more detail in his personal blog and has published his analysis of the digits at ArXiv. Pi appears normal. Indeed. And it cascades all the way to the end of the web page. I wonder if I can turn it off. My, my. It goes all the way to the bone. Does William M. Briggs (Statistician to the Stars!) have the Superpowers necessary to turn off the italics? Stay tuned for the next thrilling episode. Good grief, what a dumb typo on my part. I made it not once, but twice! Fixed. Thanks! A Monte Carlo simulation is essentially a way to measure a value that can’t be found by analytic means. But, too many people thing that the Monte Carlo simulation somehow does more than this. In short, it’s a good tool to impress the naive. The focus should be on the assumptions going into the model, not on the Monte Carlo method used to evaluate the output. A lot of atheists would posit that this is nearly the argument that they’d make against the existence of God, albeit the details of the purely mechanical process are not as well known. Apologies for the unintentional testing! STEP 2: Show people the coded hypothesis and results the code was purpose-built, and often meticulously tuned, to give and hope nobody realizes (especially yourself) that it’s still the same, unverified hypothesis. Forget that nobody’s tested it in the real world and that it may in fact be entirely unknowable…like trying to determine if man killed the mammoths or not. Seems to me that, when a population is too large to examine every individual, you have to sample it. But you have to do that in a way that doesn’t add spurious information. The idea of a PRNG is to use a method having no obvious structure; of a uniform grid that its structure matches nothing in the population you’re studying. So apart from a different sampling strategy the two methods are identical. I’m not sure what you’re trying to say here. Are you suggesting MC methods deliver “better performance” *because* the MC output is “nonrandom” (i.e. pseudorandom) rather than truly random? Or maybe you are suggesting MC methods can be surpassed by some (thoroughly) nonrandomized method? >If the draws weren’t random—and never mind defining what random really means—the approximation would be off, somehow, like in a pagan ceremony where somebody forgot to light the black randomness candle. In the broadest possible terms, randomness in an important part of various processes because you can draw conclusions about what you want to do from a single case and then you want to cross-check against lots of other cases to make sure that your conclusions about Case Zero weren’t driven by an anomalous feature of that case or of some small region of the possibility-space. If the draws aren’t random, you’re optimizing your solution for whatever bias happens to built into your draw-function, not for the domain where the solution will actually be put into practice. There is no such thing as randomness. Late day, so more tomorrow. But use classic post page to find links about randomness. Question: Given that these calculations are all finite, is what you are getting at really tantamount to the well-known fact that a nondeterministic finite state machine is equivalent to a deterministic one?